We often hear these days about the effects of mould, but what exactly is mould? Mould is a type of fungi. We eat some of the types of fungi such as mushrooms, and the type of yeast that goes into bread making, even some of the cheeses that we eat and enjoy. There are also some types of mould that can be used in penicillin, a lifesaving drug. These are examples of mould that are considered beneficial to mankind. Mould is also omnipresent. In other words, airborne mould spores are generally located in all homes and businesses, is located both indoors and outdoors, but remains largely dormant until the right conditions exist for its release and multiplication. As it is light and small, often mould will multiply and spread by water or warm damp areas such as leaky pipes, leaky windows and leaks into the roof cavity. It can spread to a whole range of materials such as timber, concrete, tiles, carpets and plasterboard. Other types of mould however can be harmful to our health. 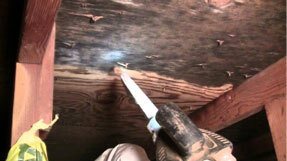 There are literally hundreds of different kinds of mould found in basements, roofs, bathrooms, and walls. Some moulds are commonly found indoors such as aspergillus, chaetomium, penicillum, and stachybotrys which is sometimes referred to as black mould. Many types of mould are black in colour. So let’s talk about these specific kinds of mould that may be harmful to your health. 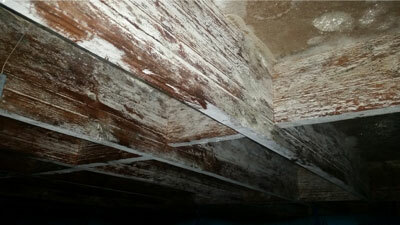 There are many reasons that homes, workplaces and commercial businesses can find themselves dealing with mould issues. They can grow on nearly any surface as long as moisture is present and they particularly thrive in dark, damp and warm spots. As mould can grow on so many surfaces it should come as no surprise that building materials are able to sustain mould growth and thus mould spores are particularly abundant indoors. In Australia, mould is prevalent in all states although the more humid areas of Australia such as the Northern Territory and Queensland have a greater propensity of mould issues. 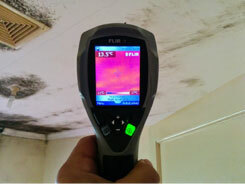 Mould thrives when the Relative Humidity (Rh) within a contaminated area is 60% or higher. In some instances, mould will be a by-product of more general water damage which in turn can be the result of a leak, seepage or even a burst pipe or water main. Storms and floods can also cause water to pool in unlikely places which can lead to hidden mould. In some cases, you can have large amounts of mould developing under the ground or within the walls – unfortunately mould colonies can live inside building structures. Another potential cause of moisture and subsequent mould growth is a lack of ventilation which can then cause moisture that is naturally in the air to build-up. This is a particularly big problem in bathrooms and kitchens which can benefit from windows or some form of extractor unit or dehumidifier. Ventilation can also sometimes be a problem in basements, as well as behind cupboards and heavy curtains. Look for places where air is struggling to circulate in your property and often you will find the tell-tale signs of mould. Where walls are very cold, this also increases the likelihood of them being moist and of them becoming mouldy. Cold surfaces may cause moisture in the air to condense on contact and this in turn causes the formation of small droplets of water on your walls and windows where this otherwise would not be a problem. Sometimes moisture and mould problems will be as a result of families and homeowners failing to adequately heat their homes during the winter months. How we identify mould issues. You can generally spot mould easily as it ranges in colour from green, black or blue fur that collects on surfaces. It is fairly unsightly and similar to the colours you would see on old bread or overripe fruit which you immediately dispose of to the bin. The life cycle of mould is dependent on its environment, its growth speed and colours vary greatly. Some of the colours of mould present may include white, green & black all of which may pose a potential health risk if not remediated in a timely manner. When these mould spores exist and multiply in large quantities they can form visible patches on walls and in other areas and can cause reactions in even the healthiest of people. Therefore, treating mould in a timely and efficient manner will assist in reducing any potential health problems and reduce treatment costs. The consequences of mould exposure. You could be forgiven for thinking you may have a cold or other associated health problems through prolonged exposure to the mould. There is a specific term for mould that creates high levels of mycotoxins which is ‘toxic mould’. ‘Stachybotryschartarum’ is one such example and can cause more severe problems if exposure is allowed to continue – and in only the most extreme cases the possibility of neurological problems or death. The first step with mould remediation as with water damage restoration will always be to stop the source of the moisture that is encouraging the spread of the mould. There are various ways to do this and some of the treatment may include replacement of impacted areas, but this will normally be completed at the assessment stage. By attending to these areas quickly and fixing these problems will help to prevent the further spread of mould and will make it possible to treat the mould in the worst affected areas. This is very important as mould can grow on porous surfaces in as little as 24 hours. 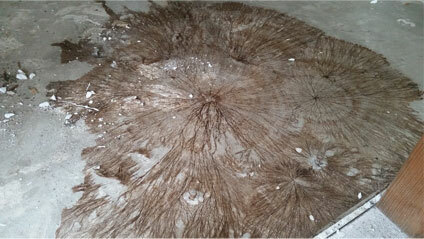 The area will then be dried which must be done carefully so as to prevent the spreading of dust and mould spores. Where the mould has set in under carpets, within the walls or in insulation, this might involve the removal of fittings and fixtures. The next stages in treatment will often depend on the severity of the mould and the extent of the damage within your home or business. For small amounts of mould it will sometimes be safe to use simple surface cleaning with a sponge or a cloth and a cleaning product. In the past some methods of mould remediation have involved the use of fungicides and hot air, though these have been deemed unsafe for the atmosphere. In more severe mould infestations, Flood Restoration Australia will ensure that strict guidelines from the IICRC S520 on procedures to remove mould will be undertaken. These are ‘high-efficiency particular air’ vacuums which are often used at the end of the mould remediation process. These can remove dust and mould spores from the affected surfaces. Re-mediators will wear PPE (personal protective equipment) to prevent themselves from being exposed to the captured mould and it will then be disposed of using tightly sealed bags. This method is used by some companies as the initial source removal stage generally from wooden surfaces and other materials such as cement. 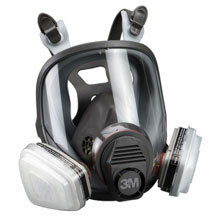 Soda blasting and media blasting can also be used. In other cases, some items may need to be permanently discarded. These include all kinds of porous materials including pillows, mattresses, plaster board walls and underlay. Mould specialists will often handle this disposal on your behalf. Cleaning may also be necessary for your heating and air conditioning systems in order to prevent the further spread of mould spores throughout your building. Some mould remediation companies will also provide additional clean-up and restoration services in order to help you get back to normal. These include such services as fabric restoration, painting, carpet installation etc. These companies ensure that you are able to return to your home and normal standard of living as soon as possible and they can be a huge benefit to families and business struggling with mould issues. Ultraviolet germicidal irradiation (UVGI) is a sterilization method that uses ultraviolet (UV) light to kill airborne micro-organisms. Bacteria, viruses and micro-organisms (like mould spores) have less protection from UV and cannot survive prolonged exposure to it. How do I know the best company to undertake my mould job? When you are unsure about mould and its possible implications, you need to find a company that is highly qualified and able to not only commence the task but also complete it efficiently and professionally. Here are some of the ways you can test to see you have the right company. 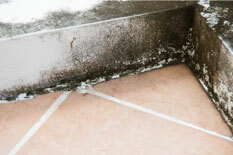 Check their website, and find out whether they have knowledge about mould and mould remediation. Look at reviews and testimonials from previous customers and to try and find out the precise range of services they provide. Does the company have the qualifications you need to ensure a professional job is completed? Accredited companies within Australia, like the USA, follow the IICRC S520 standards.